Reinforce your understanding of drugs and medication safety! 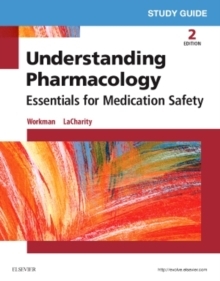 Corresponding to the chapters in Understanding Pharmacology: Essentials for Medication Safety, by M.
Linda Workman, PhD, RN, FAAN, Linda A. LaCharity, PhD, RN, and Susan L. Kruchko, MS, RN, this study guide offers content review and a wide range of engaging activities to help you master key pharmacology concepts and practice dosage calculation. Medication safety practice questions help users review math skills in the context of patient care through realistic scenarios. Learning activities in a variety of engaging formats reinforce important concepts and information for each chapter. Practice quizzes at the end of each chapter help users prepare for exams and ensure content mastery. Study tips for users who speak English as a second language provide extra help for ESL users.